Contradictory to what Ankit Bharadwaj, the person who attacked ousted Delhi minister Kapil Mishra, claim of being an Aam Aadmi Party (AAP) worker, the Arvind Kejriwal-led party on 10 May said the former is an executive member of the Bharatiya Janata Yuva Morcha (BJYM). AAP leader Sanjay Singh said the party has always been against any sort of violence in politics, adding that instead it has always been a victim of it. "Ankit Bharadwaj is the executive member of the Bharatiya Janata Yuva Morcha. Even the police has said the same. His photos are there with BJP's Pawan Sharma, Satish Upadhyay. Behind this is a big conspiracy by the BJP. It wants to bring defame to AAP. There has been a continuous effort by the BJP to act against AAP," Singh told ANI. Meanwhile, Delhi Bharatiya Janta Party (BJP) chief Manoj Tiwari dubbed the incident as 'shameful', saying that the police should increase Mishra's security. "It is very shocking and shameful. Every Indian has the right to expose corruption. But attacking him is shameful. Police should increase Kapil Mishra's security," Tiwari told ANI. Deputy Commissioner of Police (DCP) North Jatin Narwal said the accused has brought to police station and investigation is underway. "He has been brought to police station and investigation is underway. He is an AAP worker," he said. 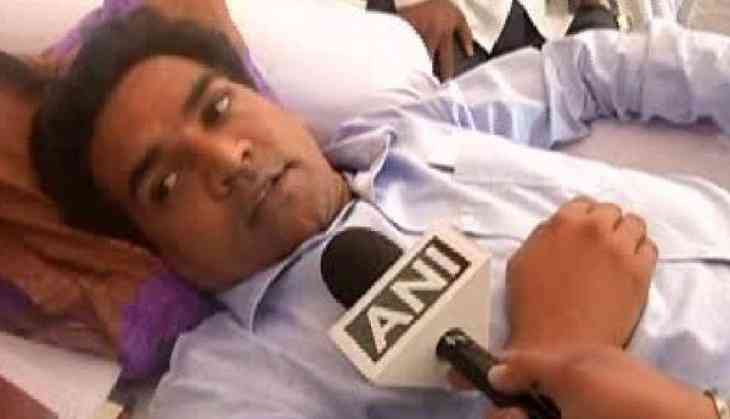 A person earlier today tried to attack Mishra who is on a hunger strike demanding the reasons behind few AAP leaders' foreign trips in the last two years. When a youth named Ankit Bhardwaj tried to attack Kapil then he was overpowered by Mishra's supporters. The Delhi Police have arrested Ankit. Mishra has asked AAP supremo Arvind Kejriwal to tell where party leaders- Sanjay Singh, Ashish Khetan, Satyendar Jain, Raghav Chadha and Durgesh Pathak- got the money from to fund their various foreign trips. In a letter, Kapil told Kejriwal, "Someone told me if these details are revealed, the public won't let you stay in power for another moment. What is the secret behind these trips?"